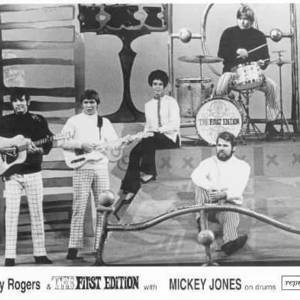 The First Edition (later known as Kenny Rogers and The First Edition) was a Country/Rock group, stalwart members being Kenny Rogers, Mickey Jones and Terry Williams. The band formed in 1967 with Mike Settle and Thelma Camacho completing the lineup. The First Edition signed with Reprise Records and recorded the pop-psychedelic single "Just Dropped In (To See What Condition My Condition Was In)", a song later to feature in the Cohen Brothers film "The Big Lebowski". The First Edition signed with Reprise Records and recorded the pop-psychedelic single "Just Dropped In (To See What Condition My Condition Was In)", a song later to feature in the Cohen Brothers film "The Big Lebowski". Within a year, the group was billed as "Kenny Rogers and the First Edition" and in the summer of 1969, they once again hit the charts with "Ruby, Don't Take Your Love To Town" (US #6, UK #1). For the next two years, the First Edition bounced between country, pop and mild psychedelia, enjoying world-wide success.